A 2017 makeover — to the tune of £80 million — gave new life to this mid-century modern hotel, located within striking distance of Hyde Park and Lancaster Gate. Famed architect Richard Seifert, the man behind London buildings like Centre Point Tower and Natwest Tower (the tallest in the City of London), designed the distinctly ’60s property before its opening in 1967. Today, the Royal Lancaster still draws attention, thanks to its sleek mid-century mod furnishings, a critically acclaimed Thai restaurant, and sweeping views of London from every single guest room. Proximity to Central London, Hyde Park and the Lancaster Gate Tube station make the Royal Lancaster an easy choice for business and leisure travelers alike. Tourists can pack a picnic for Hyde Park, or take long and leisurely walks to Buckingham Palace or Notting Hill (each less than two miles from the hotel). Taxis frequently drive by the hotel, so it’s easy to get around if you don’t want to figure out the Tube. Guest rooms are bright and spacious, with décor that nods to the ‘60s without feeling costume-y — think mustard-colored pillows, gold-accented coffee tables, and mirrored furnishings. Bathrooms are well appointed with waterfall showers, toiletries from The White Company, heated floors, and bathtubs in all but the lowest category of rooms. 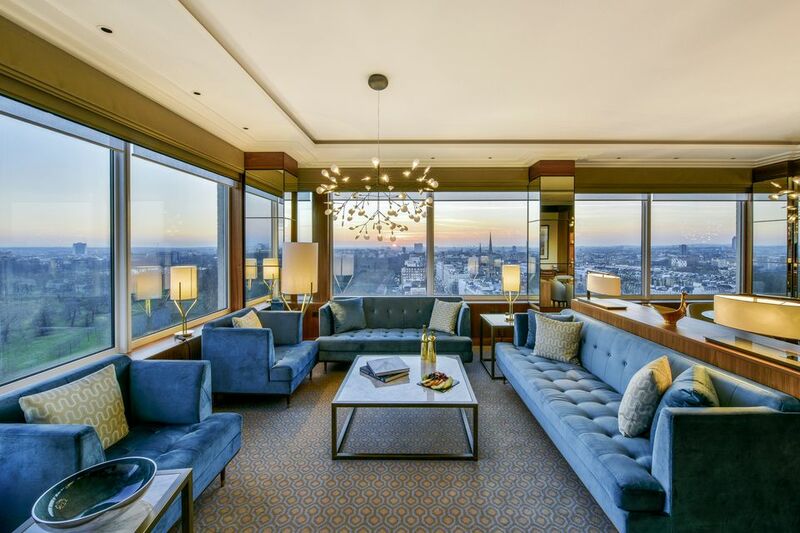 For the best rooms in the house, request a spot on the 18th floor, the highest in the hotel. The ceilings and windows are taller on the top floor, which means that the views out to the city are all the more impressive. Amenities throughout the hotel are a notch above standard, too, making it easy to settle in and get comfy. In your room, snack on treats from the minibar; plug into international outlets (no adapter required); and bundle up in terry cloth robes and slippers after stepping out of that waterfall shower. That sense of comfort extends to the 24-hour on-site gym, a spacious one by hotel standards that's stocked with chilled water and fluffy towels. Perhaps the best perk? Smart phones (called “Handy Phones”) are available for use in your room and around town throughout your stay — perfect for international visitors with pricey data plans, or anyone who wants to have a spare device on hand while touring. The hotel’s owners are Thai, so it’s no surprise that its flagship restaurant, Nipa Thai, is a standout. The restaurant is one of only 55 restaurants in London to receive the Thai Select label, a certification from the Thai government that recognizes authentic Thai cooking around the world. It received 2 AA Rosettes, a UK certification given to hotel restaurants — less than 10 percent of all hotel restaurants in the country receive even 1 Rosette. And its kitchen staff is 100 percent female, a rarity in Western restaurants but the standard in Thailand. The lobby's gleaming Hyde Bar hits all the right notes, whether you're kicking off a day of sightseeing or heading home for the night. Settle in for light breakfast pastries in the morning; tuck into warm cheese tarts and fresh scones at lunch time; and indulge in high tea with the works mid-afternoon. By night, grab a glass of bubbly and a canape before dinner, or sneak in a nightcap and a snack of fish-and-chips post-pub crawl. The cocktail menu is remarkably thoughtful for a hotel lobby bar, too, with offerings such as the Rhubarb Sour with Plymouth gin, Cointreau, grapefruit, and rhubarb bitters. For a happy middle ground between fine Thai dining and small plates in the lobby bar, head to Island Grill. The restaurant overlooks Hyde Park, and claims 2 AA Rosettes of its own, thanks to a menu focused on local and seasonal dishes — think beef and bone marrow pie, cured Scottish salmon, and 35-day dry-aged British steaks. On the weekends, tuck into a two-course brunch with unlimited Aperol spritzes, or a classic Sunday afternoon roast.